Agnes, the welfare worker who helped Ernest, putting together a rough sleeper pack. Ernest graduated in environmental science in his native Poland, before moving to Sheffield to work. Ernest lived in Sheffield for nine years, with in regular employment and staying in his own accommodation. He describes a normal life, working, seeing friends, and with various interests including collecting stamps and coins. However, following an injury he lost both his job and then his home, and for three years he had been sleeping rough, during which time he had been assaulted and had also been hit by a car, fracturing his shoulder. Ernest survived by begging on the streets, but his life turned around when a passer-by, instead of offering money, gave Ernest a voucher for St Wilfrid’s Centre entitling him to a shower, a hot meal and some warm clothes. It took Ernest several weeks to build up the confidence to come to the centre, but on his first visit he was welcomed by Agnes, a welfare worker who is herself Polish. When Ernest was begging, he was often given foreign coins. He has kept these, and now they are not only a part of his coin collecting hobby, but they are also a reminder of the difficult times and the progress he has made. 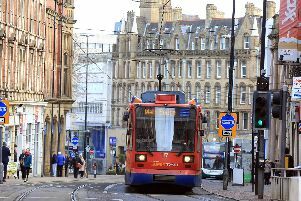 The kind of misfortunes that resulted in Ernest becoming homeless are becoming an increasingly common experience in Sheffield. The latest government statistics show the number of people sleeping rough in Yorkshire increased by 19 per cent over the last year. This mirrors the direct experience of St Wilfrid’s who have seen a 22 per cent increase in self referrals over the last year. St Wilfrid’s Centre are holding their Annual Sleep Out in the centre’s car park on Friday March 29 to raise funds for their work. To take part, visit www.stwilfridscentre.org and follow the Sleep Out link. If you would like some St Wilfrid’s vouchers to distribute, call 0114 255 5720.